In recent years, University of Utah biologists showed that when wild-type mice compete in seminatural “mouse barns” for food, territory and mates, they can suffer health problems not revealed by conventional toxicity tests on caged lab mice. This test previously found mouse reproduction and survival was harmed by inbreeding, certain medicines and fructose comparable with human doses. Now, in a new study, the sensitive toxicity test detected impaired reproduction in mice caused by genetic mutations that had seemed harmless when studied by developmental techniques. When University of Utah geneticists swapped two mouse development genes in a 2006 study, the mice suffered no apparent harm. But the new study used the sensitive mouse barn test and found mice with the swapped gene held fewer territories than control mice, and produced fewer offspring that carried the swapped gene. Thus, the new research shows that genes once thought to be redundant actually play distinct roles. And the mouse barn test provides scientists a tool to find out what a change in a gene does to change how an organism functions, says biology professor Wayne Potts, senior author of the study scheduled for online publication Oct. 7 in the journal Genetics. 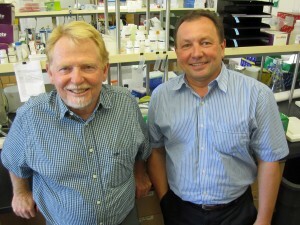 University of Utah biology professor Wayne Potts and human genetics research associate Petr Tvrdik. “We can sequence the entire genome [an organism’s genetic blueprint] and know all the genes, but we’re still in the infancy of bridging the chasm between understanding an organism’s genetic makeup and how that affects their complex bodies,” Potts says. Scientists cannot ethically manipulate human genomes, so they use mice as models or stand-ins, since 99 percent of human genes have mouse counterparts. “It is important to keep developing genetic tools and models to better understand the outcomes of the function of the genes on the fitness of the organisms,” says study co-author Petr Tvrdik, a research associate in human genetics. Potts, Ruff and Tvrdik conducted the study with lab director Linda Morrison; University of Utah biology undergraduates Raed Saffarini, Leda Ramoz and Shambralyn Baker; and University of Central Oklahoma mathematical biologist Sean Laverty, who earned his doctorate at the University of Utah. The new research built on a 2006 study by Tvrdik and University of Utah geneticist Mario Capecchi, who won a Nobel Prize in Physiology or Medicine in 2007. Both the 2006 study and the new one dealt with Hox genes, which are like orchestra conductors because they direct the actions of other genes during development of animal embryos. Each of the 13 Hox genes found in early animals evolved into four genes roughly a half-billion years ago, then some of those 52 genes vanished because they were redundant or unneeded, leaving 39 Hox genes to control the body plan in vertebrate animals, including humans and mice. As part of their 2006, study, Tvrdik and Capecchi swapped the coding or protein-making regions of Hoxa1 and Hoxb1 mouse genes – which are involved in brainstem development – and found the resulting mice were normal. That was a surprise, because without Hoxa1, mice die after birth because a malformed brain stem impairs breathing. Without Hoxb1, a nerve is missing and mice have facial paralysis. Similar rare defects occur in people with missing Hoxa1 or Hoxb1. In the new study, the researchers bred and used wild-type house mice in large, room-sized enclosures called mouse barns, which allow the animals to compete for space, food and mates much more normally than inbred lab mice, which often fight in small cages. The test’s formal name is the Organismal Performance Assay. Each of six mouse barns was divided by wire mesh into six territories, each with either an open or protected nest box. Implanted radio chips and antennas at feeders kept track of where mice fed and thus the territories they occupied. Eight to 10 male mice and 18 to 20 females were put in each mouse barn, for a total of 176 mice: 58 male and 118 female. Half the mice in each barn had two copies of the normal Hoxb1 gene and half had two copies of the swapped gene with Hoxa1. The mice lived in the barns for 25 weeks, and produced 1,145 pups. 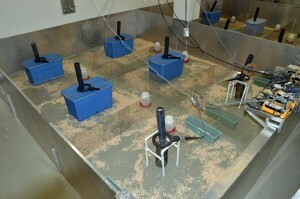 View of a University of Utah “mouse barn” used in a sensitive toxicity test that makes wild-type mice compete in seminatural conditions. — There was no difference in death rates between mice with the normal Hoxb1 gene and those that had it swapped with Hoxa1. But mice with the swapped genes held 44.7 percent of mouse barn territories, while those with normal Hoxb1 genes held 55.3 percent of territories – a 10.6 percent difference. — When the researchers considered only offspring with two copies of the normal gene or two copies of the swapped gene, those with the swapped gene produced only 64 percent as many offspring as those with normal Hoxb1 – another indication the swapped gene causes reproductive problems. The Hoxb1 and Hoxa1 genes were thought previously to function redundantly without harming mice. “This new study shows they function differently,” Tvrdik says. Potts says that with roughly 15 percent of knocked-out genes resulting in animals that appeared normal, scientists adopted the idea that many genes are functionally redundant and can back up disabled genes. “With results from this study and various other studies, that conventional wisdom is falling by the wayside,” he adds. The mouse barn test is able to detect defects that modern developmental tests miss because “we take the whole organism and test it under rigorous conditions that require high performance from most of the physiological systems of the body,” Potts says. PHOTO CREDIT: Wayne Potts, University of Utah. 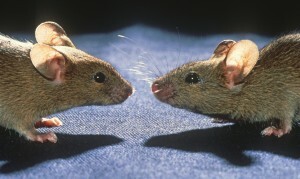 Two of the mice used in a sensitive new toxicity test developed at the University of Utah. A new study shows the test can detect cryptic genetic defects.